Nice set, thanks for sharing! My pleasure, I am pleased you found them interesting. What type of winch vehicles were used by the RFC? I have seen a photo of a Leyland and also the FWD which was at Crystal Palace IWM, but I think the FWD arrived right at the end of the war. Anybody know? Reference to post 444. My old unit had photos of our WW1 forefathers marching to war with the very radios shown. I stood as a 17 year old cadet in the same place as the photo was taken, an old sweat that had served northern Ireland said look closely at the faces lad "they where just the same you". A thought that never left me. Pleased to hear those old photographs brought back some meaningful memories for you, and that the Mobile Telephone Exchange Van is as you remembered it years later. 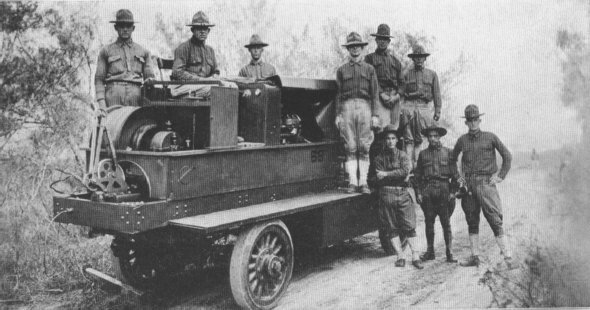 What type of winch vehicles were used by the RFC? 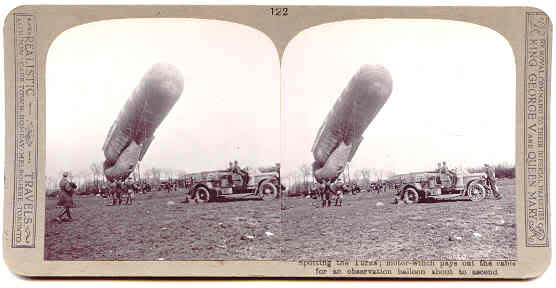 Photographs or details of the Observation Balloon Winch Trucks used by the RFC during WW1 are extremely difficult to find, and I have been looking for some good photos for a while. Photographs of German and American Balloon Winch Trucks, for some reason, are much easier to find. 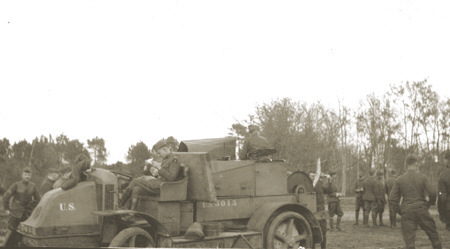 I had seen a report, which I have not been able to confirm, relating to the RFC also using the Swedish Scania-Vabis Truck as a Balloon Winch Truck during WW1, and I have a photograph which could possibly be such a RFC Winch Truck , I also have a photograph of a WW1 Observer Balloon with its Winch Truck. Hopefully, these photographs may be what you are looking for. One of the type of mobile Observation Balloon Winches used by the Germans during WW1. I think the first photo is of a German truck. The flanged wheels were for use on railway tracks. Thanks. Those are very interesting. That last one looks rather small for a balloon winch truck. I can imagine the whole thing being dragged along in a gust of wind. Also the cable looks too thin for a Drachen. Cant think what else it might be though. Perhaps for a smaller balloon? I had not heard of the RFC using Scania trucks before. Something for me to research when I have a quiet moment. The wheel extensions on the first one, if it is not for use on railway tracks could they also be used to provide extra traction in muddy conditions? Make steering a little bit heavy though. Another interesting photograph, again illustrating the enormous requirement for motor vehicles for the war effort, with a line of new ambulances awaiting distribution extending for one mile somewhere in France during World War I. This is a fantastically composed shot, with the motor vehicles having all been staggered at the same angle as the breaks in the trees.The three strong lines created by the two avenues of trees and the edge of the trucks, also lead the eye through the image. A photograph illustrating on one hand the soon to be obsolete horse drawn equipment, and on the other, the new motorized equipment. British horse drawn artillery moving forward past lines of the new French Peugeot Armoured Cars, somewhere in France. Many thanks, I am still trying to identify this Balloon Winch vehicle. The problem with these 100 year old photographs, is many are without captions, and need identification. 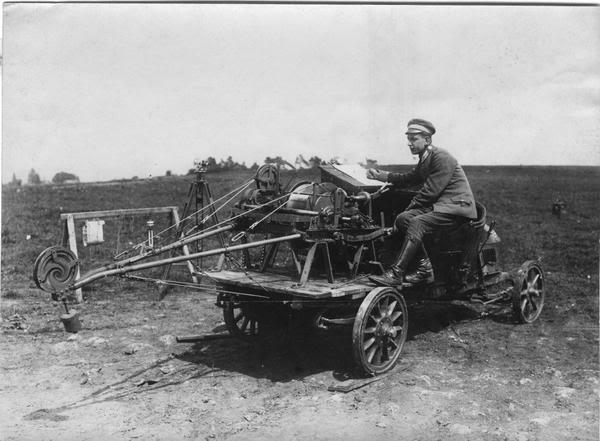 The German photo is clearly a mobile winch for some type of small balloon, and if you look carefully at the other clues in the photograph, the writing board he is using, the other equipment set up behind the winch, hopefully, this will help to identify the small balloon used with this mobile winch. 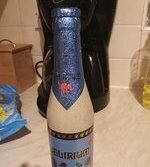 Pleased to hear from you again, and many thanks for the info on the Albions and the Renaults. 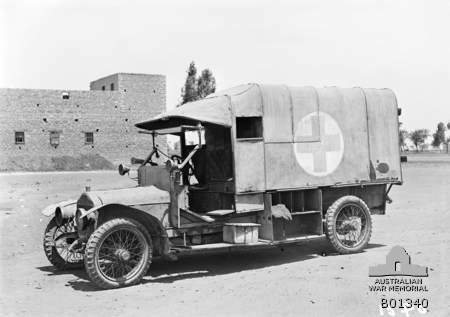 In some cases, photographs were deliberately given different captions, which was done for propaganda purposes, as with the staged photograph of the ' mile long line of vehicles ', and with no vehicle markings being shown, that photograph was probably used for various propaganda purposes and may have had various captions to suit those purposes, as with them being described as ambulances. Also, I had not seen the quilted radiator/bonnet covers in use before. 1914 Wolseley mobile operating car. Great photograph, first one I have seen showing details of the interior. I know you have an interest in trains, so attached is a nice photograph of an Ambulance Train with its locomotive. 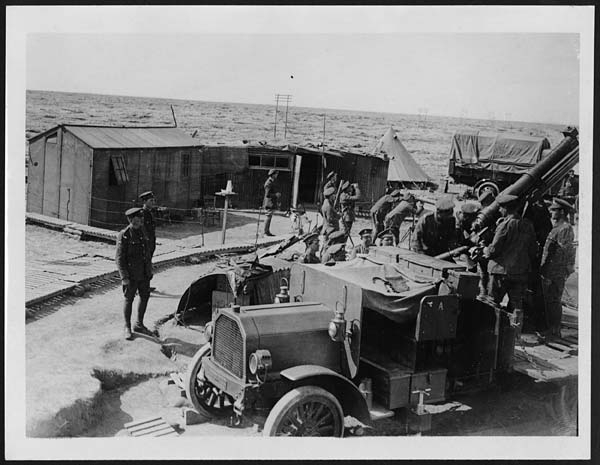 Various interesting photographs of British mobile Anti-Aircraft units, some of which were providing Observer Balloon protection. In the top photograph we also see members of the unit using Ranger Finder equipment, all the photographs were taken in France. 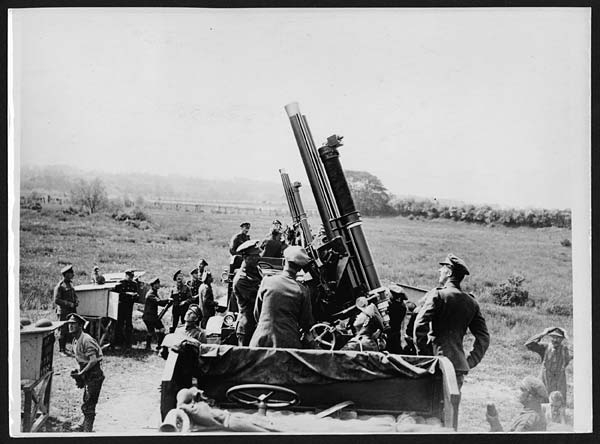 They all show 13-pdr, 9-cwt AA guns. I've never really understood why they put the two guns of a Section so close together at some positions. The extreme range was something like 6,000 yards so you would have thought it would have been more effective cover is the guns had been spaced much further apart. That guns were put within a few tens of yards of each other is indisputable and the second picture shows that this is a long-standing position because the 'rabbit hutches' on the LH side are additional ammunition lockers to those on the lorries. I've seen very similar constructions on another photo so I'd guess there was an RGA guideline for them. The third photo puzzles me. The four lorries are nose to tail, which makes no sense at all unless they were on the way somewhere and got caught by a blizzard. It appears to have been standard practice for any gun that was en route to put itself 'in action' wherever it parked up, even if it wasn't at a recognised position. Self-defence, presumably, and that would be my guess with that image. 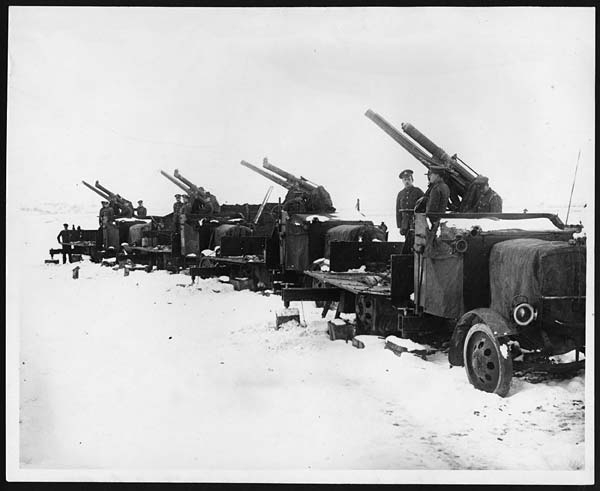 They are stuck in the snow, in what appears to be open ground so they'd present a juicy target for any enemy plane unless they defended themselves. Once again, many thanks for your informative and important input to this Thread. Also, thanks for the interesting comment on the ' Rabbit Hutch ' ammunition lockers, I had wondered what they were for, and what they contained. the second picture shows that this is a long-standing position because the 'rabbit hutches' on the LH side are additional ammunition lockers to those on the lorries. I've seen very similar constructions on another photo so I'd guess there was an RGA guideline for them. This ' long-standing ' AA Gun emplacement, could then have been for Observer Balloon protection close to the Balloon Unit. 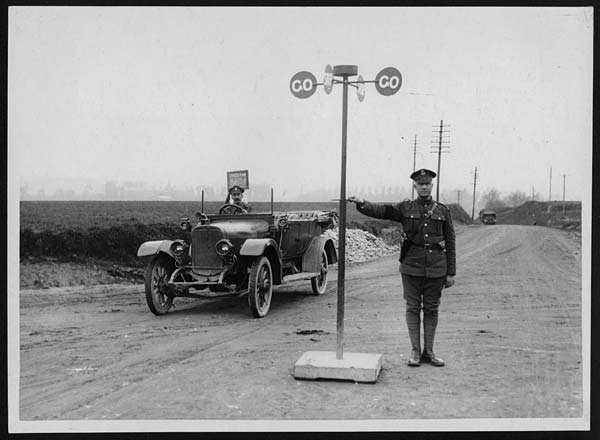 One of my favourite WW1 vehicle photographs, and the only one I have seen of an armed Military Policeman ( when the photo is enlarged there is an armband, presumably that of a Military Policeman, on his right arm ) manning a ' Stop/Go ' traffic sign at a crossroad somewhere is France. I am unable to make out if the vehicle is a Military Police vehicle, or an Army Staff Car. The locomotive is a Great Eastern one, I am not sure of the type but it appears to be one of those rebuilt from a 2-4-0. The tender is also very interesting as about 1908 the GE experimented with oil burning locomotives and it is a tender from that experiment converted to carry coal. 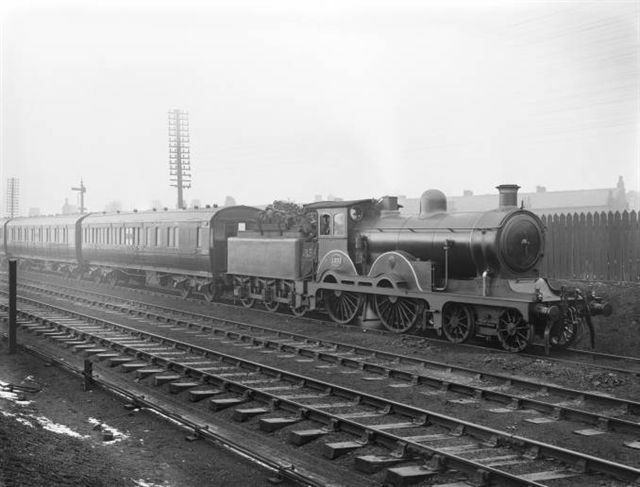 Yes, a Great Eastern locomotive No.1893 photographed in 1916, taking the Ambulance Train to Tilbury Docks. 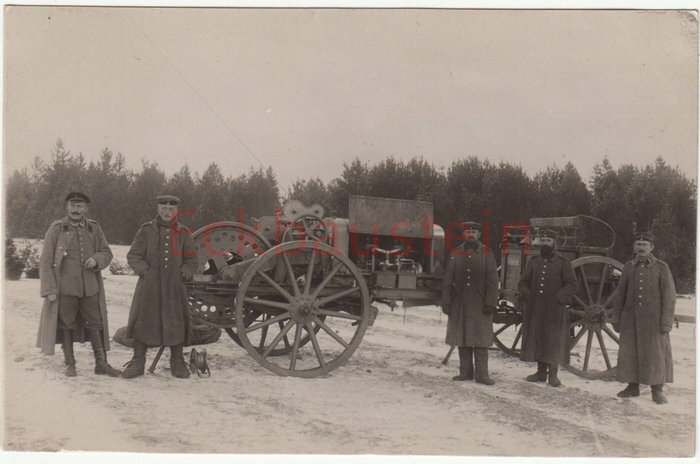 I recalled having a copy of the reverse of this German photograph with the English translation, which does describe it as being a self propelled winch, which served kite balloon ( Drachen ) units. Attached is a copy of the reverse of the photograph which is dated 17th July, 1918. 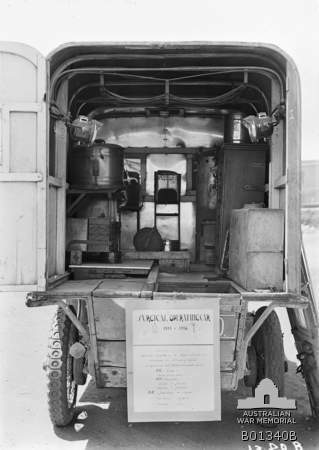 Translation - The self propelled winch, which served kite balloon units. Dieses Bild ist vom Generalstab zur Veröffentlichung zugelassen werden. Das gestempelte Original befindet sich in meinen Händen. Alle Rechte forbehalten. 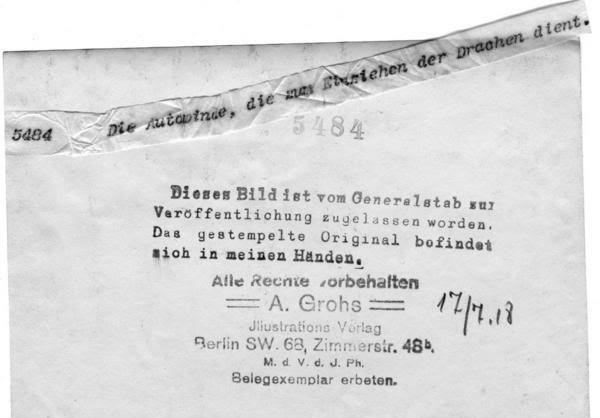 A. Grohs Jllustracione Verlag, Berlin SW.68, Zimmerstr. 48b. Belegexemplar erbeten. Translation - This image was approved (released) for publication by the General Staff. The stamped original is in my hands. All rights reserved. A. Grohs Jllustracione Publishers, Berlin SW. 68, Zimmer Str. 48 b. Here is another German Observation Balloon Winch, mounted on a horse-drawn wagon.